Bouchercon is the world’s finest annual crime fiction event, bringing together more than 1,500 authors, fans, publishers, reviewers, booksellers, editors, and every other part of the community for a fantastic four-day event. Arrived in Toronto and checked into my room. Got a nice view of the CN Tower. Went to the bank and got some Canadian money. Had lunch in the Food Court under the hotel – Chinese. Then did my volunteering gig – working the registration desk. Ann from Oz and I took a cab ($15 CAD) to Eva’s Original Chimneys (454 Bloor St W) and tried their hand-made ice cream cone – I had the typical vanilla/chocolate twist with rainbow sprinkles on the cinnamon coated cone. Yummy. To prevent the ice cream from falling through the bottom, they put a chocolate truffle as the base. We decided we would brave their subway system, which is so cool. We couldn’t just buy a one-way ticket, so we paid $20 for their reloaded card and darn if we couldn’t figure out how to pay for our fare. It was fun taking their subway – although, we couldn’t figure out if we got off the correct stop because we were looking for a particular word – but with help from a train rider we were on our way. The funny thing is we kept saying what is “M” and then we look up on the door and it told us. Then we went to the park across the street from hotel and enjoyed the TORONTO sign that changes colors three times. For some reason, I couldn’t get the colors in my picture, but it did reflect on the ground. Then I ran into my friends and spent the rest of the evening in the lobby hanging with my friends. Had an early breakfast at hotel and then Ovidia and I went to Dundas Square / Eaton Centre to take the hop on and hop off bus tour, only we plan to stay hop on and besides the weather was dismal with rain and a damp day. We saw Casa Loma, Bata Shoe Museum, China Town, CN Tower, Hockey Hall of Fame, St. Lawrence Market and the Distillery District. Then we decided to walk back to the hotel from within the Eaton Centre mall and the walk wasn’t that bad, since when we came out of the underground mall, we were right next to the clock building. Later I had a pre-convention board meeting and after, there was more hanging out with friends. Met Judy, Kristopher, Michael, Ann from Oz and Kris’ friend Erin LaBonte-Mckay for breakfast at Tim Horton’s. After, they went to the Speed Dating Event and I went to the panel that I was on: Bouchercon 101. On the panel were Jeff Siger, Ruth Gordon, Erin Mitchell, Mike Bursaw, Dru Ann Love and Helen Nelson. We had to tell a story and for the life of me, I could not remember Sue Grafton’s name so instead I said “you know the Y-Lady, the one who writes the alphabet book.” And everyone knew who I was talking about and then the other panelists talked about their encounter with the “Y-Lady.” It was funny. Then went to the Kensington gathering where I saw a plentitude of authors (Gave a big hug to Laura Bradford) and picked up two books from new upcoming series. A group of us (Judy, Susie and Risa) went to SOMA Chocolatemaker in the Distillery District for a chocolate tasting, where I braved sampling the three different types of dark chocolate and yes, they had one milk chocolate sample). We also got to taste pure chocolate nibs and chocolate dust (that’s what I’m calling it. It which was very informative. For dinner, another group (Susan Elia MacNeal, Judy Bobalick, Erin Mitchell, Susan Vasli) went to Maezo Restaurant– an Indian restaurant where we and shared five dishes. Everything was delicious. Then onto the Opening Ceremony and then the HarperCollins reception. As part of my Bouchercon tradition, I had breakfast with Rae James who writes the fabulous “Hollis Morgan” series. Then it was off to a few panels where I was waylaid and missed a few panels chatting with friends along the way. Then there was the GMM board meeting where we voted four new members on the board. Next up was the Librarian’s Tea where an unexpected event happened – – the fire alarm went off and like the person she is, Hank Phillippi Ryan held court with great aplomb, even incorporating the fire alarm in her talk. Interesting note was the fire alarm had a nice melody as it rang throughout the evening. Had dinner with Matthew, the former English Teacher, Eric and Aimee at BNB (Burgers & Bistro) restaurant where I had once again, the Chorizo Rigatoni. Yum, Yum. The evening closed with the Pub Quiz, hosted by the Crime Writers of Canada, which was a barrel of fun. Our team lost with a score of 13 points, but we had a good time. The day started with the Sisters in Crime breakfast where Diane Vallere gave her last speech as President. New President is Kendel Lynn. Then it was the day I have been waiting for. A group of us (Art, Judy, Rae, Janet, Susie, Alice, John, Eric, Aimee, Ovidia, and I) went to the Fairmont Royal York Hotel for an Afternoon Tea event. To get there, we traverse through the underground and oh what a lovely walk it was as we consulted various maps to get us there on time. The Library Room where the tea was held was picture perfect, although one of the picture on the wall was slight skewed. The tea was perfect. I selected the Jasmine tea which was heavenly as was the traditional finger sandwiches and their selection of pastries. Because my friend Eleanor couldn’t attend, I was sending her pictures of so that she can join us vicariously. After tea, a few of use trekked back to hotel underground while another went topside. While at the hotel, I get a message from my New York friend, Judi, telling me she is also in Toronto and we agreed to meet up for a few minutes in the hotel lobby. Next up Judy, Kristopher and I walked in the rain to the Minotaur reception that was held in the La La Club and then to the Seventh Street reception that was held in the Ben McNally Book Store. The evening closed with dinner with Kristopher, Nikki and I at Shopsy’s Deli Restaurant. My last day with the crime fiction tribe. Of course, at 4 in the morning, there was a loud argument outside my door (drunken guests) and soon I heard banging on the doors (not my door). I heard later that security was called. On the agenda, was brunch and the Anthony’s Award. After a few goodbyes, it was time to leave where I encountered a 3-hour delay due to air traffic. Finally arrived home at 11:30 and crashed. After a 3-hour delay, finally taking off. Looking forward to next year’s Bouchercon which is being held in St. Petersburg, Florida. The Anthony Award nominations for 2017 have been announced on the Toronto Bouchercon website. Winners will be announced in Toronto at Bouchercon’s Passport To Murder in October. Below is the list of nominees. Congratulations to them all! I arrived in New Orleans a couple of days before the start of the convention to get in some sightseeing. First on the agenda was a 2-hour highlights tour of New Orleans. We stopped at Willies for our first taste of New Orleans foods eating Chicken Fingers and it was delicious. Then onto our tour where we saw the sights and sounds of New Orleans that included a stop at St. Louis Cemetery #3, a stop in City Park where we had our first taste of beignets amid a thunderstorm and lightening. Then off to tour Katrina and it’s aftermath. Our final meal of the day was at Creole House where I had the Taste Of The Bayou which is a combination of bayou traditions: Chicken & Andouille Gumbo, Crawfish Etouffée, Red Beans & Rice and Cajun Jambalaya. The next day we walked to the Aquarium only to find it closed. Then we took the railroad to Jackson Square. We strolled in several of the stores on our way to Café du Monde. We sat in Jackson Square Park and enjoyed the shade and then headed back to the hotel. We had lunch at Palace Café and for our evening meal, we went to Mimi’s for TAPAS. I always wanted to know what it was. I sampled the duck, salmon and broccoli, and steak; I didn’t even look at mushroom plate. Then back to hotel for conversations with other early Bouchercon attendees. Tuesday was my day to volunteer, so I helped stack books for the Book Bazaar and was impressed with how it was set-up. Then we took a trip to Central Grocery, home of the Original Muffuletta Sandwich. A traditional-style muffuletta sandwich consists of a muffuletta loaf split horizontally and covered with layers of marinated olive salad, mortadella, salami, mozzarella, ham, and provolone. Then a group of use headed to Napoleon House where I. ATE. ALLIGATOR. It was very gamey but good as I ate all of it while left the regular sausage on my plate. Wednesday, I went on another on another 2-hour tour, this time St. Louis Cemetery #1, where we saw plenty of mausoleum and shrines. We even saw the tomb that actor Nicholas Cage has built. Then it was off the the BOLO Books soiree where we dined on appetizing snacks and imbibed Lemoncello. A good time was had by all. Thursday was the first official day of the convention and my panel was at noon. We were given a 3-section room and I was surprised that it filled up as it did. The opening ceremony featured the guest arriving on floats. That was fun. Saturday I attended Ellen Byron’s book launch for Body on the Bayou at Hall-Barnett Gallery where the appetizers were appetizing and the drinks flowing. Another good time was had. I could tell you more, but I don’t remember much, but these pictures highlight my first trip to New Orleans. Enjoy! Have you ever attended a reader/author convention? Bouchercon is the world’s finest annual crime fiction event, bringing together more than 1,000 authors, fans, publishers, reviewers, booksellers, editors, and every other part of the community for a fantastic four-day event. I love reader/fan conventions which are truly a godsend for book loves like me. 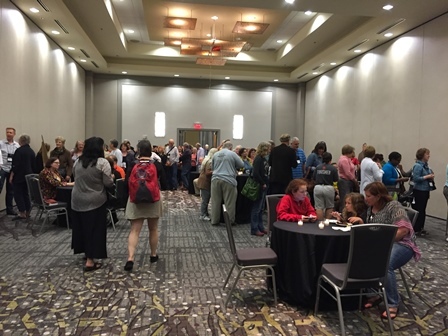 From arriving in Raleigh, North Carolina on Tuesday to leaving Sunday morning, it’s been a whirlwind of non-stop activities (okay I did allow 5 hours for sleep) of hilarity, dining and plain old-fashioned fun at the 2015 Bouchercon. In addition to that, I am deeply honored that my blog, dru’s book musings, was nominated for a 2015 Anthony Award for Best Critical or Non-Fiction Work, but alas I did not win. Again, the honor was being nominated and I felt like a princess throughout the convention as everyone came up to greet me celebratory congratulations on the nomination. My first day there was an adventure as my flight was delayed and then a airport worker’s mishaps caused another delayed. Happily we landed and we were free to start our new adventure. I like to arrive early so that I can volunteer my services before the convention started. It’s a good way to help and get to know other readers and authors as well. This year, we got shiny badges to signify our volunteerism. Because it’s our tradition, I had a lovely time and conversation with Susan Boyer at our Pre-Bouchercon dinner. After dinner Priscilla B. and I went exploring in the vicinity of the Sheraton and Marriott Hotels. First sighting of the day Ali Karim and Laura DiSilverio. Had a nice breakfast with Priscilla, and Ovidia Y., where we joined Laura DiSilvero at the Plaza Café. Volunteered by helping stuff book bags and inserting additional materials in envelopes. The rest of the day was spent author watching until it was time to head out to dinner where Gayle Trent arranged a pre-Bouchercon dinner over a T.K. Tripps. In attendance was Aubrey Nye Hamilton, Priscilla Caporaletti-Bean, Gayle Trent, Toni L.P. Kelner, Ovidia Yu, Barb Goffman, Sherry Novinger Harris,Shari Randall, and Alan Gratz (photo courtesy of Aubrey Hamilton). After dinner a few of us went to the see Susan Boyer and Art Taylor at Quail Ridge Books & Music where they were doing a book launch. Wine and crackers were served and a good time was had by all. I know I did something later in the evening, but it’s all a blur. Having breakfast with Kristi Belcamino, Kristopher Zgorski, Judy Bobalik, and Ann from Oz at Jimmy V’s Osteria & Bar located in the Sheraton’s lobby. We had a lively conversation this morning at breakfast and some of the words bantered around were YayNo, entourage, I thought it was Literature, Assistant are paid – Partners are not, and Horse deliverers. Then it was off to the Author Speed Dating event where authors get 2-3 minutes to tell us about their books. You also pick up swags, chocolate and good book recommendations. I attended the New Faces – Best First Novel Nominees with Margaret Maron moderating; Kristi Belcamino, M.P. Cooley, Julia Dahl, Allen Eskens and Lori Rader-Day. I like going to this panel to see up and coming authors. I’ve read two of the new faces and plan to read the others. I had lunch with Dorothy McFalls at The Twisted Mango and I had the fish taco. Then it was time for my panel: Tweet This: Taking Social Media to the Next Level with Deborah Lacy moderating and Maddee James, Janet Rudolph, Cara Brookins and myself sitting on the panel. We had standing room and people who came up to me after the panel said they got good information from it. 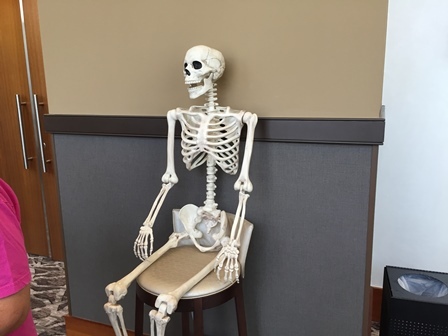 I was happy to see some of my friends in attendance. We had a pre-opening ceremony dinner with Kristi Belcamino, Julia Dahl, Lori Rader-Day and Martha Cooley at Jimmy V’s. Then it was time to attend the opening ceremony where nominees were given their certificate of nomination … then had to scoot out to volunteer at the HarperCollins book signing event where I helped give out the books for Kristi Belcamino and Deborah Crombie. I went to the BBQ that was held under the tent and enjoyed some chicken, coleslaw and sweet tea. Then it was off to the first ever “Game Night” with Kendel Lynn, Diane Vallere, LynDee Stephens Walker, Debra Goldstein, Riley, Melissa Lenhardt, Nancy G. West, Paula Benson, Rochelle Staab, Susan Boyer, Wendy Tyson, Eleanor Caewood Jones, where UNO, Pictionary and Spoons were played. I never laughed so hard that night. A fun time of ruckus laughter, covert moves and hilarity ensured especially when the game of Spoons was played. At the other table where they were enjoying a game of Pictionary was loud as well. Diane Vallere sure knows how to capture her spoons – achieving the status of SPOON Queen of the Night. Had breakfast at Jimmy V’s with Matthew Clemens, Judy Bobalik, Kristi Belcamino, and Claire Booth. Then it was off to attend a couple of panels that were engaging. I attended my first Bouchercon Members Business Meeting where we approved the 2019 Dallas Bouchercon and the 2020 Sacramento Bouchercon events. I had lunch at The Twisted Mango with Nancy Parra and I had chicken wings. Then it was off to my buddy Kristopher Zgorski panel where he was moderating. Unknowingly, Libby Fischer Hellmann and I were waiting on the couch for the same person, Judy Bobalik. 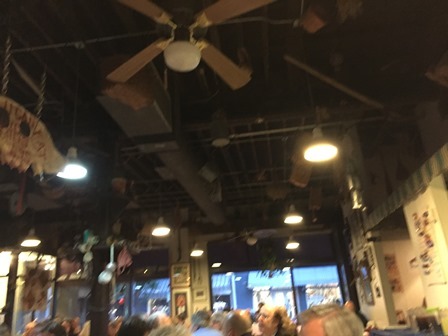 We walked over to Big Ed’s City Market Restaurant to attend the Shamus Award. I had southern fried chicken, green beans (they were Good), coleslaw and delicious sweet tea. It was my first time attending this event and I had a good time. I love the décor of the place. After dinner, I made my way back to the second “Game Night” and what a fun time was had by all. Had a nice breakfast with Jack Getze at the Sheraton restaurant Jimmy V’s, then went to check out the rest of the New Author’s Breakfast. Attended a few more panels and then had a nice lunch with Kendel Lynn and Diane Vallere. Had pre-dinner with LynDee Walker at Tango Twist where I had the nachos and then it was time for the Lifetime Achievement GoH Spotlight featuring Margaret Maron and after that the Anthony Awards Ceremony. A late night gathering with Eleanor Cawood Jones , Matthew Clemens and Michaela Shannon-Sank at Jimmy V’s ended the day. I had breakfast with Sj Rozan and Ovidia Yu at Jimmy V’s and then it was the evitable…saying goodbye to all my friends. Goodbye until New Orleans. Nominees were selected by attendees of 2014 Bouchercon in Long Beach and registrants of 2015 Bouchercon in Raleigh. Awards will be determined by Bouchercon attendees in Raleigh, October 8-11, 2015. Arrived in Long Beach in time to watch Castle marry Beckett and off to bed I went. Met for the first time Judy B. (we were both still on our respective time zone hours) for breakfast at the hotel’s restaurant, Tides. We spent most of the breakfast laughing our hearts out and decided that we are sisters from another mother. Next it was time to meet with Ingrid W, who was taking me to her local nail salon to get my manicure/pedicure. Enroute, I got to experience small town Long Beach and its colorful buildings. Back at the hotel and to the book room to help fold papers, and stuff book bags. Then Susan B and I had our traditional pre-conference dinner at PF Chang. Facebook status: The tech came and fixed my thermostat and left me a card giving me a complimentary meal at the hotel’s restaurant. I signed up for the Hollywood Stars tour and the Haunted Tour at the Queen Mary. The tour was lots of fun with the tour guide pointing out sites that included the building they use to simulate the Empire State Building; saw that streets that is supposed to replicate NY’s Fifth Avenue. We arrived at the Hollywood sign and I took a few pictures; he even pointed out Steven Spielberg’s compound and the house that Mel Gibson knocked off its stilts in one of the Lethal Weapon movies. Next stop was the drive towards Beverly Hills and Rodeo Drive before we ended at Grauman’s Chinese Theatre, now known as TCL Theater where I took lots and lots of pictures of the stars that adorn the sidewalks. We even saw them putting in the star for Matthew McConaughey. On this tour, we saw Marilyn Monroe house and the courthouse where the OJ Simpson trial was held. Back to the hotel that was ablazed with authors arriving. I was invited to the VIP tour of the Queen Mary and dinner to follow. Oh the guide was telling us about the ghosts in the first class pool when I looked in the corner and saw something. Yep, those ghosts know how to find me. Dinner was at the SKY Room and the first thing I noticed when I put my bag down at the first empty table I saw, was the place setting for J.A. Jance. J.A. Jance! OMG! I love her work and was thrilled to be sitting at the table with her, her husband and her editor. We had such a good time getting to know Judith and what a glorious time we both had. She told her the backstory on her novella that comes out at end of November. You should have seen me and Shawn Simmons Reilly…we were in heaven. Dinner was salad, salmon, spinach, potatoes and instead of crème brulee, I had three small scoops of vanilla ice cream. After dinner, it was back to the hotel and the bar where the drinks were flowing and laughter was heard throughout the universe. I know I’m forgetting a lot but I was in my element enjoying myself. Facebook status: First celebrity (author) sighting today was Cathy Pickens and then Catriona McPherson. Thursday was the first “official” day of Bouchercon and it started with Author Speed Dating; Murder, We Wrote with Donald Bains and Renee Paley-Bain, moderated by Tom Sawyer; If I Knew Then What I Know Now with Brett Battles, Jessie Chandler, John Connolly, Elaine Viets, Martyn Waites, moderated by Marilyn Beebe; Mixing Murder With Food with Connie Archer, Leslie Budewitz, Daryl Wood Gerber, Karen MacInerney, Ovidia Yu, moderated by Kate Carlisle. Facebook status: On the agenda today: Author/Friend Sightings! Facebook status: Met Kristi Belcamino. Facebook status from Hank Phillipi Ryan: How cool is this? Dru Ann is helping Bouchercon 2014 – Murder at the Beach guest of honor J.A. Jance Author’s Page sign her new books. They were chatting like the best of pals…this a pretty plum assignment, I must say! What a treat to see. Today was the day I’ll be sitting on my first even panel. I was a bit nervous but my fellow panelists were cool. (There goes that word again). 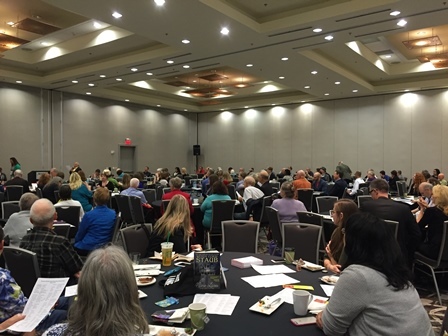 But first I went to the 7am Meet the New Authors Breakfast hosted by Mike Befeler; and then it was time for my panel: Super Fans and How They Got Involved – Al Abramson, Kerry Hammond, Me, Doris Ann Norris, Janet Rudolph, moderated by Brad Parks. It went well and I even told my Sue Grafton story. It was great to see my friends in the audience and that relaxed me more than they know. Then I had one of the best opportunities ever, a meet and greet with the writers and cast of TNT’s Major Crimes! Major Crimes. How awesome was that and I enjoyed the intimate session where we got some great scoops and insights into this wonderful show. After the meet and greet, we followed the cast and writers to the Major Crimes panel where the spoke to the larger Bouchercon audience with Q&As. Then it was onto the Berkley Cocktail Reception in the Sky room – but this time we were on the lower floor. Back at the hotel’s rotunda was the Dessert Reception & Live Charity Auction hosted by Hank Phillippi Ryan and Simon Wood. Facebook Status: Two of the highlights of my day is meeting Kristi Belcamino and helping pass the J.A. Jance’s new book to sign for readers. The other highlights is seeing all my old friends and making new friends. Facebook Status: The panel I was on went well. I was so nervous. Facebook Status: The coolest highlight was the meet and greet with the writers and cast of Major Crimes. Thanks Deborah Lacy! Today was the day I moderate my first ever panel at a reader/author convention. Yes, I was a bit nervous but not as anxious since I survived the panel I sat on. Barbara Graham and I were in the room and since it was an early panel, we were hoping no one showed up and we would have it in the back of the room with us. Little by little, the attendees grew until it was time for us to sit on the dais. My panel was Add Spice to Your Crafts: Murder With your Favorite Hobbies with Barbara Graham, Sybil Johnson, Author Jennifer McAndrews, Camille Minichino, Clare O’Donohue and moderated by Me. From various comments, the session went well. There were laughter here and there. The best part was finally meeting Sandra Balzo. And the funny part was once I met her, I saw her at least 4 times that day. Obviously the day got away from me as I can only recall attending the Jungle Red Writers panel with Deborah Crombie, Hank Phillippi Ryan and Julia Spencer-Fleming moderated by Rhys Bowen. Then it was onto the Long Beach Performing Center where the presentation of the Anthony Awards were given out. I was happy to hear my friend Judy announced as the winner of the David Thompson award and to hear Joelle and Catriona name announced as an Anthony Award winner. I later discovered that my friend Brad won a Shamus and Art and Terry won a Macavity. Congrats to all the winner. Facebook Status: Another highlight…I finally met Charlaine Harris! How cool is that? Facebook Status: Yesterday was a good day. My panel, according to eye witnesses and passerby, went well. Received a nice twitter note from Alex Segura. Facebook Status: From the “you did good” to “it went well,” sounds like the panel I moderated was good. We had a few chuckles and that’s always a good thing. I like to thank Clare O’Donohue, Camille Minichino, Author Jennifer McAndrews, Barbara Graham and Sybil Johnson for making it so easy. Thanks guys! Facebook Status: One of the highlights of the day is seeing Sandra Balzo. Facebook Status: I’m on a mission to get one more book signed. Following a lovely Post–Anthony Awards reception hosted by Grand Central Publishing, the day came to an end. Now it’s time to say goodbye to all and the highlight of the day was going to the Concierge floor and checking out the view of the Queen Mary in all its glory and the Carnival cruise ship. Until the next reader/author convention…I’ll see you soon. Thanks to all who made this a memorable Bouchercon. One of the main reasons why I love going to Bouchercon is the opportunity to visit other cities that I’ve always wanted to visit. In 2011, I attended my first Bouchercon in St. Louis and what I knew about St. Louis was the Cardinals, the Clydesdale horses and that Gateway Arch. Yes, my eyes were on going up that arch but when I got there and saw what I would have to sit in, the joy was just standing under the arch. Of course, it’s hanging out with the authors that bring me to this reader/fan convention. I love my author sightings when I see an author or two or three or four or hundreds. In addition, you know where to find us….at the bar. My second Bouchercon was in Cleveland in 2012 and I was excited because one of the places we were going to see was the Rock & Roll Hall of Fame. I arrived one day early and took the train in and lucky for me because that’s where I met Ingrid Willis, the organizer of this year’s Bouchercon in Long Beach. As my normal, my friend and I went to the aquarium and then took the 2-hour Lolly the Trolley tour where we saw the Flats, Downtown, The Warehouse District, Ohio City, The Gateway District, Playhouse Square, Millionaire’s Row, The Cleveland Play House, the Cleveland Clinic, the museums and institutions of University Circle, the Cleveland Cultural Gardens & City Greenhouse, the Lake Erie Shoreline and North Coast harbor. And as always, it is having an author sighting and hanging with the authors in the lounge or bar area. My third Bouchercon was last year in Albany NY. Again, I arrived early and went on a tour of the State Trooper’s facility, which was fun, especially the DNA lab. I didn’t do much sightseeing there, but the architecture on several of the buildings was amazing. The convention was held in the EGG and some of my memorable moments were pre-B’con dinner with Susan Boyer, Matthew Clemens and Eleanor Jones waking up early to have breakfast with me and dining alfresco on truck food with Ovidia Yu. Of course, the bar and lounge area was the happening place. I’m looking forward to my fourth Bouchercon held in Long Beach. I can’t wait to go on the Queen Mary tour and perhaps explore some of Los Angeles tourist attractions. Anyway, it will be having that first author sighting of B’con that will put a smile on my face and the friendly screams and hugs that envelopes me as the authors begin to fill the hotel and convention hall. What is your Bouchercon moment? You can join all the Bouchercon 2014 fun this November 13-16 in Long Beach, California. The Guests of Honor are J.A. Jance, Edward Marston and Jeffery Deaver and the Toastmaster is Simon Woods. This past week, I attended my second Bouchercon Mystery Convention, held in Cleveland, Ohio. It is a gathering of mystery authors and their fans to co-mingle, attend panels and just have fun. As an introverted person, I really abandon my shyness when I’m surrounded by the authors who have become friends and I excited and thrilled when I’m talking to them, dining with them or hanging out in the bar. In addition, there are those friends I’ve made who I can’t wait to see at this annual event. It’s non-stop action all the way and even if I’m tired from the day’s events, there’s a smile on my face and joy in my heart attending this conference. I got in a little earlier to get in some sightseeing. I met my friend C. C. and we went to breakfast at Addy’s and then walked around and then went into the Horseshoe Casino where a guard gave us a tour of the three floors. The main floors had the penny, nickel and 2 cents slots; the second floor has the quarter and dollars slot and then we went into the high roller room where I saw a slot machine for $500. On the lower level is the buffet. Then it was off to the Greater Cleveland Aquarium where we saw jellyfish, alligators, piranha, octopus, stingrays, starfish, sand tiger sharks and I learned how to tell a female shark from a male shark. They had a walkway where the animals swam over your head. Cool. Next up was our 2-hour Lolly Trolley tour where we saw the Flats, Downtown, The Warehouse District, Ohio City, The Gateway District, Playhouse Square, Millionaire’s Row, The Cleveland Play House, the Cleveland Clinic, the museums and institutions of University Circle, the Cleveland Cultural Gardens & City Greenhouse, the Lake Erie Shoreline and North Coast harbor. The next day two of the panels I attended were the Mystery Southern Style with Cathy Pickens, Tina Whittle, Jaden Terrell, Kathryn Wall and Donna Andrews and 50 Shades of Cozy with Rosemary Harris, Dorothy St. James, Duffy Brown, Catriona McPherson and Clare O’Donohue. We didn’t have enough time to explore the whole museum, however, I did gazed and admire the items from Michael Jackson and the Supremes. If I’m ever in Cleveland again, my goal is to spend the day enjoying the history of the music scene. 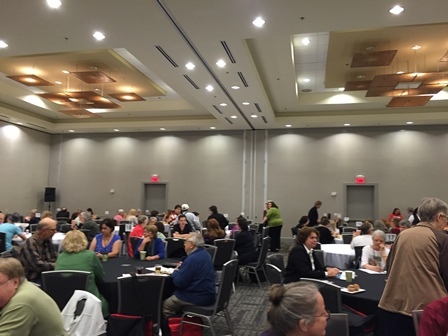 The next day I was invited to attend the 2nd Annual Librarian’s Breakfast with Mary Higgins Clark and then invited to A Cozy In Cleveland Tastemaker’s Luncheon where Casey Daniels and Amanda Flower were on the panel. The panels I attended were Those Crafty Sleuth with Lois Winston, Mollie Cox Bryan, Joanna Campbell Slan, Penny Warner, Kylie Logan; Eve of Destruction with Nancy Martin, Deborah Coonts, Sophie Littlefield, Tracy Kiely; I Am Woman Hear Me Roar with Nora McFarland, Sara J. Henry Jennifer McAndrews, Zoe Sharp, Meg Gardiner and Taylor Stevens; Girls Just Want To Have Fun with Lucy Burdette, Rhys Bowen, Deborah Cromble, Hallie Ephron, Rosemary Harris, Hank Phillippi Ryan and Julia Spencer-Flemming with her husband on the panel as well. (I had a role – my job was to hand deliver the prizes to the winners) and Judging a Book by its Cover with Robin Agnew, Sara Rosett, Marcia Telley, Heather Webber, Denise Swanson, Daryl Wood Gerber/Avery Aames. I also went to the craft session with Penny Warner and made a pendant. On Saturday I spent more time hanging with authors but did attend a few panels: Elementary My Dear Cleveland with Leslie S. Klinger, Michael Robertson, Dan Andriacco, Laurie R. King, Sara Paretsky and Daniel Stashower and two Guest of Honor Events with Elizabeth George and Deborah Crombie and Mary Higgins Clark and Carol Higgins Clark. After that event we had the silent auction and the Anthony Awards were presented and my friend Julie Hyzy won the Anthony for Best Paperback Original: Buffalo West Wing. After the Anthony Awards, Kensington had a Meet the Authors Reception. And then it was all over. I can’t wait for the next mystery convention. Meeting my favorite authors is a thrill and sometimes I act like a fangirl and squeal. What would you do if you met your all-time favorite author?